Wade in the stream & catch frogs. Follow the tracks of a deer. Make coal-burned bowls & spoons. Learn to carry fire from one place to another safely. Earthfriend Discovery Day Camp is committed to nurturing the loving and magical connection the young naturally feel with their environment and all forms of life on this planet. Earthfriend Discovery Day Camp was started in Summer 2004 with seven campers. Over the years the camp has grown with many campers returning year after year. In 2007 and 2008, the camp had 20+ campers attending. 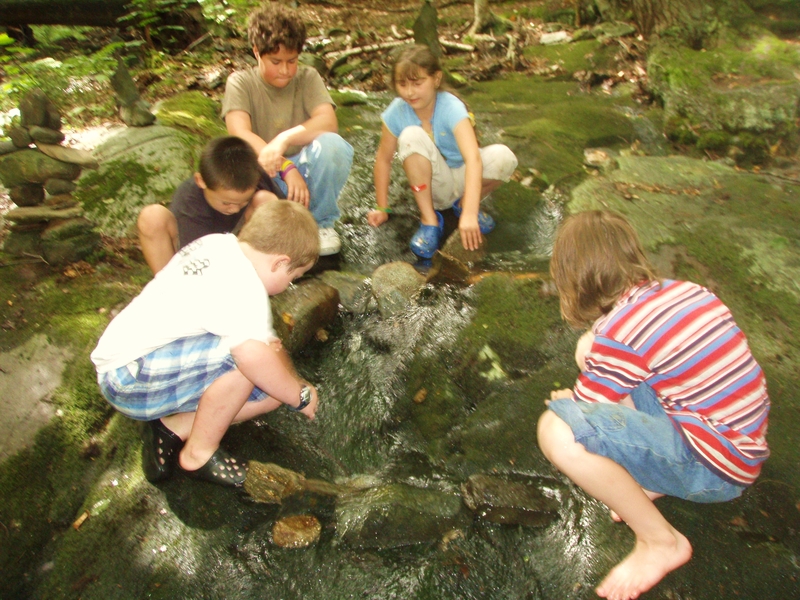 Starting in 2010, the Manitou Project began partnering with Vermont Wilderness School. VWS provides quality, experienced staff and a new level of professionalism to the camp experience while continuing to embody the Manitou Vision of the camps. This year the Lead Instructors for camp will be veteran camp instructors Amy Hyatt (both weeks of camp) and Bob Etzweiler (second week only). Located at Manitou Land in Williamsville, VT. 20 minutes from downtown Brattleboro. or e-mail EarthfriendDDC@gmail.com for more details.